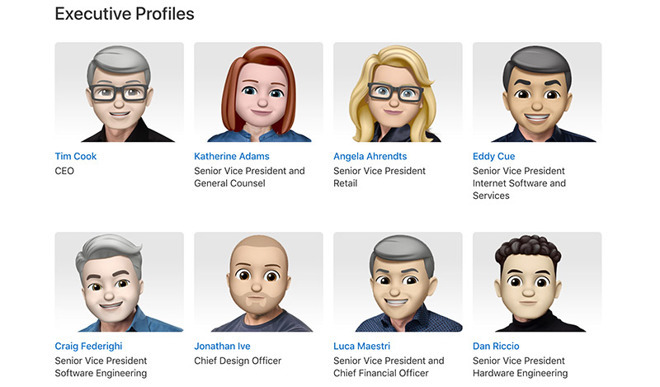 In an update to Apple's Leadership webpage on Monday, the tech giant replaced official photographs of 17 top executives with custom Memoji characters created in their likeness, from CEO Tim Cook to SVP Jony Ive and VP of Environment, Policy and Social Initiatives Lisa Jackson. With Memoji, users can create an animated 3D self-portrait for use in Messages, recorded video and FaceTime. As seen in the screenshot above, the cartoon avatars were crafted to reflect each exec's profile picture down to their facial expression, hairstyle and head pose. Announced at Worldwide Developers Conference in June, Memoji is a highlight feature set to debut alongside iOS 12 this fall. Based on Animoji, which relies on the TrueDepth camera system to animate 3D emoji-like characters, Memoji takes the system one step further by adding user creation tools into the mix. As AppleInsider outlined in our initial explainer, Memoji includes an impressive slate of user-customizable characteristics, including skin color, head shape and a wealth of options for eyes, brows, nose, ears and more. The feature is scheduled for release in iOS 12 alongside new ghost, koala, tiger and t-rex Animoji characters. In addition, both Animoji and Memoji will get "tongue detection" for recognizing and displaying tongue movement. Apple is using World Emoji Day as a chance to push upcoming products and services. The company earlier today teased forthcoming emoji designs based on characters added to Unicode 11.0. Set to debut in iOS and macOS later this year, the emoji include a range of expressions like cold face and party face, as well as new plants, animals, food and more.